The first and only luxury train in India offering tours to Southern region, the Golden Chariot is an award winning luxury train offering 2 itineraries across some of the most prominent destinations in South India. Designed to recreate the aesthetics of Dravidian cultural ethos, this Indian luxury train comes equipped with state of the art amenities to offer unique travel experiences in India in unparalleled élan and luxury. All inclusive tariff, gracious hospitality and impeccable service along with a host of cultural interactions translating into unique guest experiences will leave you enthralled and spell bound as you come across the mesmerizing sights and sounds of India’s most vibrant region during your Golden Chariot train tour. Rediscover the charm of elegant traveling as you hop aboard the Golden Chariot to discover many worlds rolled together into two luxury train journeys. 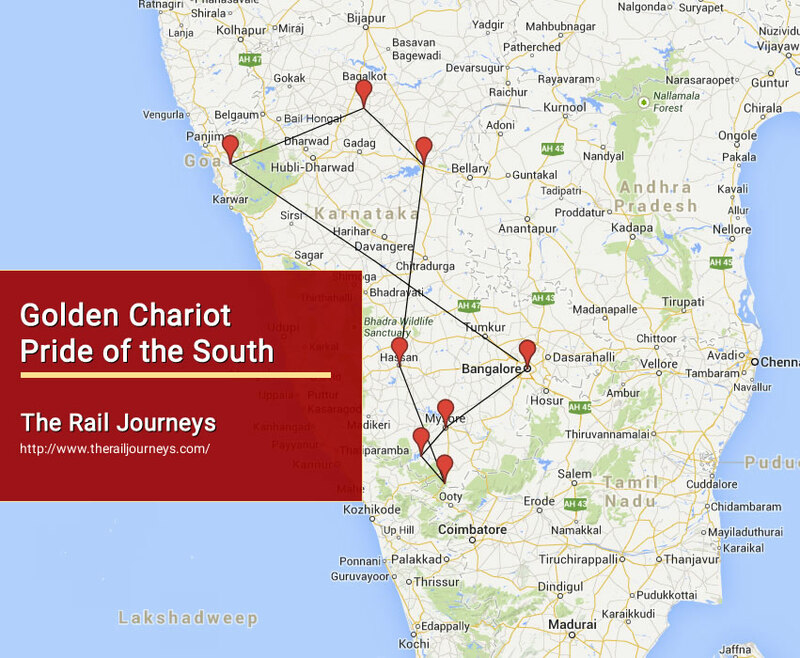 The Golden Chariot offers an attractive sojourn across Karnataka, aptly christened as the Pride of the South. Commencing on Monday from Bangalore and concluding back in Bangalore, the following Monday, the Pride of the South tour offers to its visitors an 8 day itinerary of pure fun. Capture the essence of Karnataka through this journey and carry back fond memories to remember for long. The itinerary for the luxury travel has been given below. The day-wise program will help you to plan your schedule in a hassle free manner. 15:00 hours Arrive Taj West End to proceed for the check-in formalities at the hotel followed by the Hi-Tea at Banquet Hall at 16:00. 17:00 hours Proceed for the presentation on do’s and dont’s for The Golden Chariot tour followed by a visit to Chitrakala Parishad / Art gallery. Conclude the tour with a cultural show. 19:00 hours Arrive at Yeshwantpur railway station to a traditional Aarti and Tikka with floral garlands. 21:00 hours Departure time for The Golden Chariot train, dinner will be served on board. 08:00 hours Enjoy a leisurely breakfast on board. 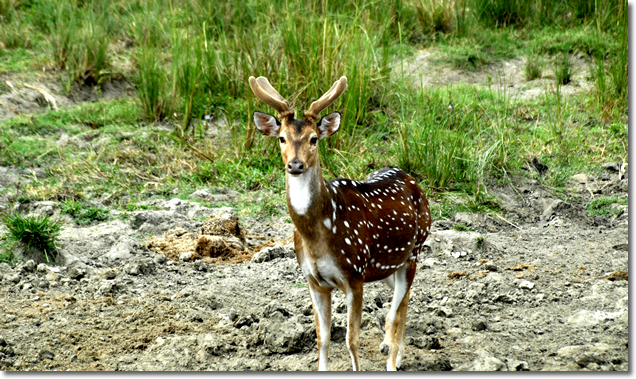 10:00 hours Disembark from train and embark on journey to the Bandipur National Park, Kabini. 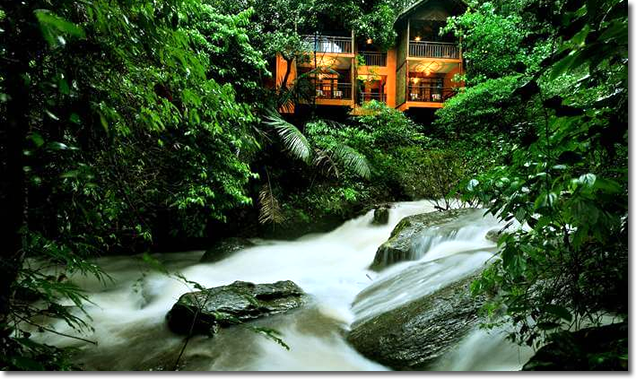 13:00 hours Arrive at the Jungle Lodge followed by lunch. 14:00 hours Embark on boat safari across the jungles followed by the wildlife film Viewing. 20:00 hours Dinner and overnight stay at jungle lodge. Meal summary Breakfast, Lunch & Dinner is included, as per the Golden Chariot package. 06:30 hours Embark on boat safari across the jungles. 09:30 hours Departure to Mysore after breakfast. 11:30 hours Transfer back to Golden Chariot. 13:00 hours Lunch will be served on board The Golden Chariot. 15:00 hours Sightseeing tour of Mysore and Srirangapatna. 19:00 hours Arrive at the Lalitha Mahal Palace for dinner followed by a cultural performance. 22:00 hours Transfer back to Golden Chariot. 06:00 hours Proceed towards Hassan aboard the train. 08:15 hours Arrive at Hassan railway station. 09:00 hours Depart for Shravanabelagola. 11:00 hours Visit to Brihadeeshwara Temple, built in the 10th century by Raja Chola. It is considered to be artistically the most perfect of Dravidian temples. 13:00 hours Lunch will be served on board train. 15:00 hours Leave for exploring Belur and Halebid. 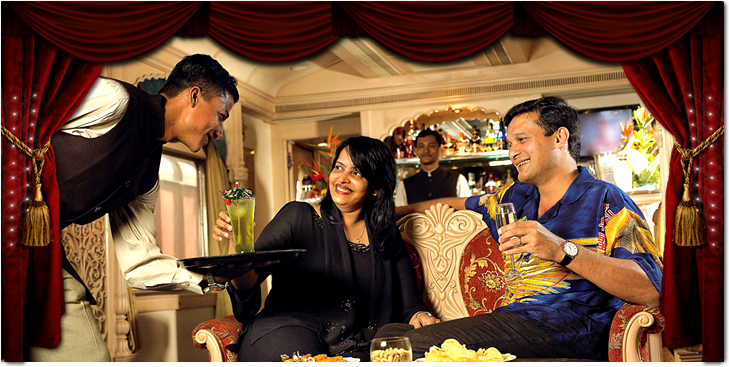 19:15 hours Transfer back to Golden Chariot to relax and enjoy on-board facilities. 19:45 hours Departure time for The Golden Chariot train and dinner will be served on board. 06:00 hours Arrive at Hospet. 07:00 hours Breakfast onboard the luxury train. 08:30 hours Depart for sightseeing in Hampi. 13:00 hours Lunch on board Golden Chariot. 16:30 hours Sightseeing tour of Vittala Temple (The Stone Chariot). 20:00 hours Return to train for dinner and overnight stay. 05:00 hours Golden Chariot leaves for Badami. 07:30 hours Breakfast on board The Golden Chariot. 08:40 hours Sightseeing trip to Badami Caves and Pattadakal. 13:30 hours Lunch will be served on board train. 14:00 hours Departure time for The Golden Chariot train. 09:30 hours Breakfast on board Golden Chariot. 10:00 hours Sightseeing trip across Goa. 12:15 hours Visit Portuguese house, Goa market etc. 19:15 hours Transfer back to Golden Chariot followed by the dinner on board. 21:00 hours Departure time for The Golden Chariot train. 08:00 hours Breakfast on board Golden Chariot. 10:30 hours Arrive Bangalore and de-board the train Golden Chariot. 20% of the ticket value at the time of booking. 80% of the ticket value 45 days before the departure date. 15:00 hours Arrive Taj West End to proceed for the check-in formalities at the hotel followed by the Hi-Tea at Banquet Hall at 1600 Hrs. 20:00 hours Arrive at Yeshwantpur railway station to a traditional Aarti and Tikka with floral garlands. 90:30 hours Drive through Marine Beach to Mamallapuram World Heritage Site known for its ancient temples and stone carvings inspired by the Pallava art followed by the lunch at GRT Temple Bay. 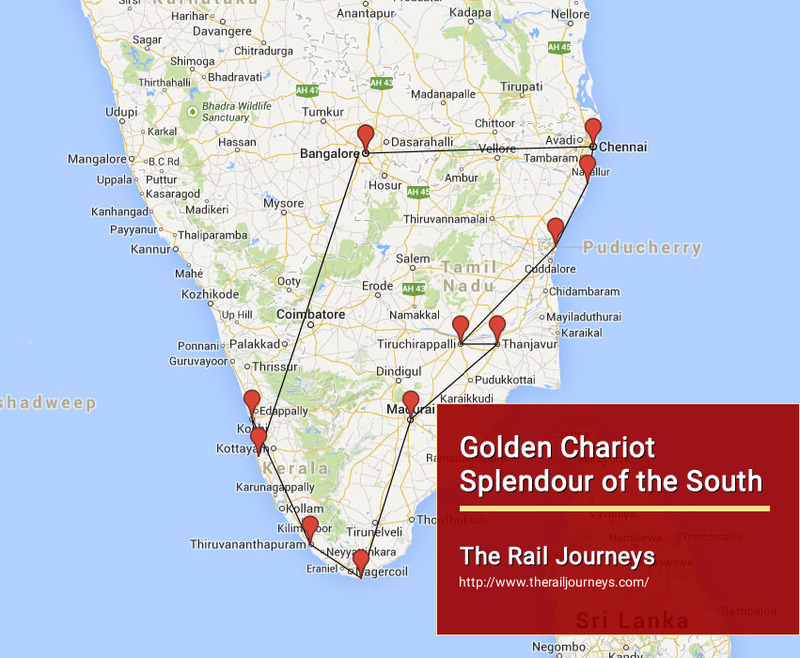 16:00 hours Drive to Pondicherry railway station to board the Golden Chariot. 18:00 hours Arrive Pondicherry and stroll through the Pristine Beach at Pondicherry. Pondicherry has a rich French cultural heritage, having been the capital of the French colonies in India since the 17th century. The French legacy is visible in the well-planned town, neatly laid roads, wide and vibrant beaches, beautiful promenades, architecturally imposing churches and public buildings and the statues. Split into two parts, Pondicherry is, on one hand a bustling Indian Market town, and on the other hand, towards the sea, the streets are emptier, cleaner and decidedly European. 20:00 hours Inner onboard The Golden Chariot. 23:30 hours Overnight at The Golden Chariot train at Pondicherry. 09:30 hours Morning, visit Sri Aurobindo Ashram, located on Rue de la Marine, is the most popular attraction in Pondicherry The Ashram was founded by Sri Aurobindo Ghose in 1926. Sri Aurobindo, the poet philosopher founded the Ashram to help man reach the zenith of his evolution through spiritual exercises and yoga, combined with physical activity and productive work. 13:30 hours Lunch will be served on board The Golden Chariot. 17:30 hours Evening, stroll around French town / beach. 19:30 hours Dinner will be served in a local restaurant. 23:30 hours Departure time for The Golden Chariot train. 09:00 hours Visit Trichy situated on the banks of the river Cauvery is the fourth largest city in Tamil Nadu. It was a citadel of the early Cholas, which later fell to the Pallavas. Trichy is a fine blend of tradition and modernity built around the Rock Fort. Apart from the Fort, there are several Churches, Colleges and Missions dating back to the 1760s. The town and its fort, now in Trichy were built by the Nayaks of Madurai.Visit the Rock Fort, which is a landmark of Trichy. The rock is one of the oldest in the world-approximately 3.800 million years, which makes it as old as the rocks of Greenland and older than the Himalayas. A climb of 434 steps leads to the ancient temple of Ganapati on top and a further climb to a Shiva Temple. You will visit Sri Rangan Temple. 11:30 hours Visit to Brihadeeshwara Temple, built in the 10th century by Raja Chola. It is considered to be artistically the most perfect of Dravidian temples. 13:00 hours Lunch will be served at Hotel Sangam, Tanjore. 15:00 hours Visit the Tanjore artifacts and Paintings workshop. 17:00 hours Transfer back to Golden Chariot to relax and enjoy on-board facilities. 20:00 hours Dinner on board The Golden Chariot. 00:15 hours Departure time for The Golden Chariot train. 08:00 hours Breakfast on board Golden Chariot.One of the oldest cities in South India, Madurai has been the centre of learning and pilgrimage for centuries. Spread along the rocky banks of the river Vaigai in the state of Tamil Nadu, this modern industrial city is today famous as a temple town. 09:30 hours The temple town is unique in that all its temples are living temples and it remains a major religious centre attracting pilgrims the year round. Madurai’s main attraction is the famous Meenakshi temples in the heart of the old town, a riotously baroque example of Dravidian architecture with Gopurams (towers) covered from top to bottom with a breathless profusion of multi-colored images of gods, goddesses, animals and mythical figures. The temple complex is a city within a city and one can spend days exploring its labyrinthine corridors and halls. 18:00 hours Enjoy light and sound show at Tirumalai Nayak Palace. 20:00 hours Enjoy the live classical music at Heritage Madurai followed by dinner. 22:00 hours Board Golden Chariot. 23:15 hours Departure time for The Golden Chariot train. 05:00 hours From 0345 Hrs : Golden Chariot arrives at Nagercoil station. 05:15 hours Drive to Kanyakumari to enjoy sunrise Kanyakumari, at the tip of peninsular India, offers a panorama of the confluence of the Bay of Bengal, the Arabian Sea and the Indian Ocean. 07:30 hours Transfer to Golden Chariot and breakfast on board. 09:30 hours Visit the famous Padmanabha Palace also known as Wooden Palace. Once the official residence of the erstwhile Travancore dynasty Padmanabhapuram palace complex is regarded as Asia’s largest wooden palace the palace has fourteen structures spread over an area of six acres. The palace is also noted for its rich mural collection tracing back to the 17th and 18th century. The earliest of structures here is believed to have been constructed in 1335. Pointed gables, dormer windows and long corridors are specimens to the tradition architecture of Kerala. 11:00 hours Transfer back to Golden Chariot. 15:00 hours Arrive Thiruvananthapuram station. 17:30 hours Evening stroll through the famous Kovalam Beach. 19:30 hours Enjoy the cultural show followed by the dinner at Taj Green Cove Kovalam. 22:00 hours Departure time for The Golden Chariot train. 05:00 hours Depart to Alleppey. 07:00 hours Breakfast on board Golden Chariot. 08:30 hours Arrive Alleppey and de-board the train Golden Chariot. 09:30 hours Proceed for half day houseboat cruise (beer, coffee/snacks served onboard the cruise) with traditional lunch at Punnamada Resort in Alleppey. 15:30 hours Visit the Church, Chinese Fishing nets and then take a walk around Jew Town. 18:30 hours Transfer back to Golden Chariot. 19:30 hours Departure time for The Golden Chariot train.